Shopping for Team Fortress Action Figures? The robotic version of the RED Heavy! 1:6 scale action figure includes over 30 points of articulation. Measures 12-inches tall and includes the Heavy's signature minigun weapon, Sasha! The robotic version of the RED Heavy as a 1:6 scale action figure! 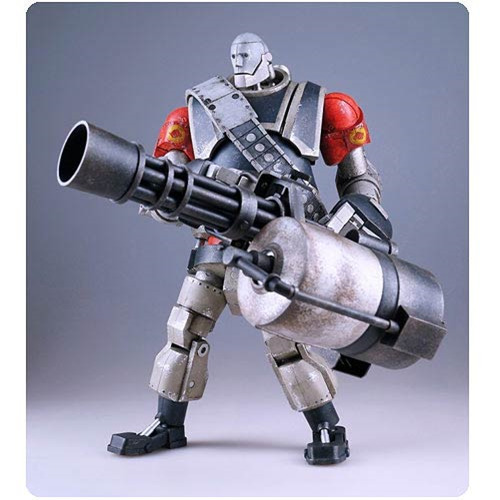 This Team Fortress 2 RED Robot Heavy Action Figure looks absolutely incredible. Featuring light-up LED eyes to make them glow just like in Team Fortress 2, this fully poseable figure measures 12-inches tall and features over 30 points of articulation. Complete with The Heavy's signature minigun weapon, this great figure from the RED team is a must-have for fans of the Team Fortress 2 video game! Requires 3 x "AG1" batteries, not included. Ages 15 and up.